Eight years ago, my wife and I, and a couple of friends, showed up at Kennedy Middle School for our first Special Olympics track practice. We had heard that they could use some coaching help. We were marathoners and our training involved a lot of running. We didn't really know what Special Olympics was all about, but it sounded fun and we wanted to help if we could. We were hooked from that very first practice. For me, it happened when I first got out of my car. A big guy named Keith rambled over to me and introduced himself. "Hi, my name is Keith...and I have a girlfriend...because I'm a good-looking guy!" There were maybe 20 special athletes at that first practice. We helped organize them into groups for their running and walking events and learned more about what Special Olympics was all about. The track and field season runs from January to May and practices are held every Saturday morning. We didn't miss another practice all year. Around the dinner table, Gina and I would share stories about our athletes with my children, who were in their early teenage years at the time. Intrigued by the stories we shared, and in need of some community service hours for school, my son Adam started coming out to practices to help. Finally, after hearing the three of us go on about how we were falling in love with our athletes, my daughter Jenna started coming out as well. It became, and still is, a passion that our family shares. We have developed some wonderful relationships with many of the special athletes in Brevard. For the next several years, we served as assistant coaches, helping at practices, and traveling with the team to County Games, Area Games, and concluding the season with State Games, which for the last 5 years have been held at Disney's ESPN Wide World of Sports. A couple of years ago, the head coach had to step down due to time constraints and I assumed his role. That's the story about our introduction to Special Olympics. For the most part, we have been involved with the Central Brevard Track and Field Team. But that's not what this story is about. 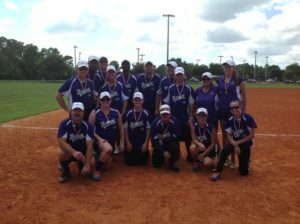 Four years ago, Coach Tonya, the County Games Coordinator and member of the Special Olympics Florida Hall of Fame, decided to put together a Unified Softball team. Special Olympics tries to mainstream the special athletes as much as possible. That's how the Unified Sports Program was born. A Unified team is made up of special athletes and partners, playing together on the same team. I am well past my prime years as a baseball or softball player, but when Coach Tonya asked if I wanted to be a part of her Unified team, I quickly accepted her offer. Little did I, or my teammates, know at the time, about the incredible journey we were about to begin. We have grown into a team that has become pretty good. We play well together as a team, but more importantly, we have developed some great relationships and have fun playing together. We've all made new friends. As an international organization, Special Olympics holds competitions beyond State Games. World Games brings together athletes from all around the world. Each country also holds a National Games competition. Both are held every four years, just like the regular Olympic Games. Most special athletes never get a chance to compete beyond State Games. And very few Partners even get a chance to compete in a Unified Sport at State Games. Imagine the excitement we all shared when we learned last fall that our Unified Team was selected to represent Team Florida at the 2014 USA Games, which will be held this week in Princeton, New Jersey. We've been working hard over the last several months, practicing, playing scrimmage games and working to raise money to help pay for our trip. It seemed like the actual competition was so far into the future. But now it's here. The hard work has paid off. We have our Team Florida uniforms and gear and this week our Unified team will be part of 180 athletes representing Team Florida in a variety of sports. But our work is not done. And neither is our fun. We will enjoy Opening Ceremonies on Sunday and begin our competition with a double header on Monday. We will play every day next week and will wrap up the trip with Closing Ceremonies on Friday night. Our goal is to bring some Gold Medals back to Brevard County. But win or lose, we will keep the Special Olympics' Athlete Oath in mind..."Let me win. But if I cannot win, let me be brave in the attempt." Whether we win Gold or not, together we will experience a once-in-a-lifetime event. We will have shared the experience with our friends and family. And I will be sharing our experience with you. I'll be posting updates to my various social media channels to keep those at home up-to-date on our trip. We are Special Olympics of Brevard's Unified Softball Team. For the last four years, we have gone by the name of Brevard Unified Softball Club. But this week, and for as long as our memories last, we are TEAM FLORIDA!